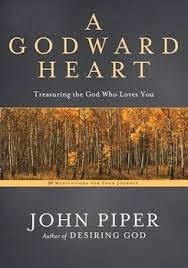 A Godward Heart: Treasuring the God Who Loves You is a new devotional from John Piper and - I shamefully confess - the first of his books that I have ever read. I thought I had read him, but I haven't. I did have the pleasure of experiencing the glory of God through Piper when I attended this conference last year. Hearing him speak made reading him all the easier for me. As I said, A Godward Heart is a devotional which arrived for review on my doorstep in early December. As it had a late January 2014 release date, I took my time reading through the 50 meditations, reading one each day. I wanted to take it slow and not rush it just because it was a review book. I wanted to savor it and glean from it. I also wanted to see how I would do with a devotional. (I'm more of a "read-it-straight-through" kind of gal, usually.) In the end, I'm glad I took my time with this one. I feel like I benefited for taking the time to soak up the things he was trying to say instead of rushing blithely on because a review needed to be written. Unlike other devotionals I've seen, A Godward Heart felt a bit more random to me in that there wasn't a common theme running throughout the entire book. One day you might be reading about seeking God's face and the next you'll discover how Piper views Twitter and why he chooses to use it. That doesn't seem cohesive unless and until you realize that Piper's passion for God invades every single area of his life - from how he views sleep, relationships, coed combat, and Lazarus's sickness and death. The purpose in his writing this devotional is to exhort you to submit all thoughts and emotions to the Lord and to pursue Him and His Word wholeheartedly. Piper's passion is to help you practically apply the Word of God to your life and to believe that God is who He says He is. I think he manages to do this with a great deal of vigor and passion for Christ which is admirable and inspiring to see. Piper's passion for the Lord screams through this book in a very appropriate manner, I think. The effect that it had on me is currently incalculable. However, I can say without a doubt that He inspired me to get in the Word and stay there. (Quite frankly, for a person who loves words and stories so much, I have a hard time staying in Scripture.) I found I actually preferred to have my morning devotional begin with Piper because his life in Christ is so encouraging to me. I would begin my quiet time by reading one meditation and then would open up the Word with a greater sense of wonder and a stronger belief that the only way to get through my day was if I read the Bible. Of course, I know that to be true whether or not I'm reading a Piper devotional but I don't think I should sneer at the gift just because I think I should have self discipline in my own right (which I should) as it is. I accept A Godward Heart as being a great boon in my spiritual walk. I've since moved on to reading Piper's The Passion of Jesus Christ and continue to find him motivational in pursuing the relationship with God that I want to have and am made to have. Christ is the glory we were made to see. His light alone will fill us and give the light of life and meaning to every part of our lives. And when that happens, we ourselves will shine and give off the rays of Christ. "If then your whole body is full of light, having no part of dark, it will be wholly bright, as when a lamp with its rays give you light" (v. 36). If you are looking for a new devotional, I present this one for your consideration. I found it to be beneficial in inspiring me in my Christian faith and also in shaping and solidifying several of my stray thoughts. I highly recommend it. Many thanks to Multnomah Publishing Company who sent a copy of this book my direction in exchange for my honest thoughts. I have received no additional compensation for this post and all opinions are my own. This does sound like a good one. I don't agree with all of Piper's views, but I have been blessed by his heart and passion for God. I don't think I have ever read an entire book of his, either, except one about Job that was actually a long poem, but I've enjoyed some of his blog and twitter posts. Like Barbara, I'm not exactly on the same doctrinal page as Piper, but I, too, appreciate his passion. I think I'd like to read this one. I have this one, and I'm kind of ashamed to say I did not know it was a devotional. It's one of those books I think I just picked up somewhere. I'm glad I know! This does sound like a good read. I too am not a big fan of devotionals. I have tried, I really have. I start out at the beginning of the year, read for the first two weeks, and then get irritated. A lot of devotionals really try to stretch the content over the course of a year and it feels like most of the devotionals are filler. Bleh. But this one sounds like it might be worth giving it a try!